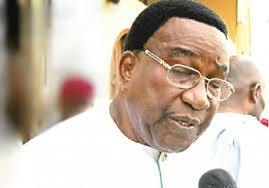 Former Governor of old Anambra State, Senator Jim Nwobodo, Friday, dumped the All Progressives Congress, APC. Nwobodo, who defected to the APC on the wake of the massive defection across the country, has rejoined his former political platform, the Peoples Democratic Party, PDP. He was conspicuously absent as the All Progressives Congress flagged off its presidential election campaign in the State on Thursday. He announced his defection during a visit by key leaders of the PDP in the Southeast to his Amaechi country home, in Enugu. On the entourage were S.N Okeke, former chairman, Police Service Commission, Prof. A.B.C Nwosu, Chief Oseloka Obaze, the Secretary to the Abia State Government, among others. They had asked Nwobodo to return to the PDP, a party he co-founded in 1998. “Why we are here is that a house you built has been vacant, we are calling on you to most respectfully step back to your house,” Okeke had pleaded. Responding to the please, Nwobodo said he was stepping aside from the All Progressives Congress, APC, chronicling various issues plaguing the nation. He said prominent political leaders from the Southeast had earlier met him in Abuja few days ago over the same issue. “It is difficult for me to ignore their call and I cannot do that. Where will I go if I’m not with you. I’m back to PDP. “I’m a democrat, I believe in democracy, those around Mr. President should tell him the truth,” he declared questioning some of the activities of the APC members.